The certified soil mapping developed by the USDA Natural Resources Conservation Service (NRCS) is the recognized soils framework layer for the Montana Spatial Data Infrastructure (MSDI). The Soil Survey Geographic Database (SSURGO) spatial data are polygons representing soil map units. The soil properties of the map unit components are provided in MS Access database tables populated from the National Soil Information System (NASIS). The attribute database associated with each survey area includes a suite of over 70 tables and reports that can be used to identify the soil series classification, soil physical and chemical properties, and interpretations about the limitations of soils for selected uses. Soils data are provided for 71 Soil Survey areas in Montana. The extent of a SSURGO dataset is a soil survey area, which may consist of a single county, national forest, or portions of a county. The MSDI soils data is provided in a separate zipfile for each survey area in Montana that includes the spatial data, and a Microsoft Access database populated with the associated attribute tables for soil map units in the survey area. All spatial data is provided in ESRI Shapefile format in WGS84 geographic coordinates. The spatial data are linked to information about the component soils and their properties for each map unit by the soil polygon MUKEY attribute. Each map unit may contain one or more major components along with minor components. The map units are typically named for the major components. 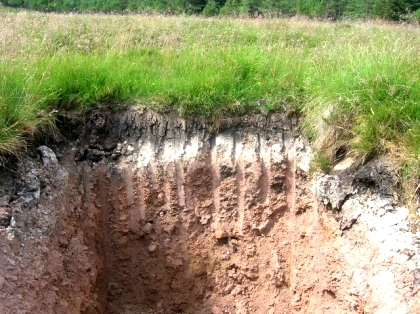 Examples of information available from the database include available water capacity, soil reaction, electrical conductivity, frequency of flooding, average yields for agricultural lands, limitations affecting road and building site development, and other interpretations based on the physical and chemical properties of the soils. The mapping is intended for natural resource planning and management by landowners, townships, and counties. Some knowledge of soils data and map scale is necessary to avoid misuse. Users are encouraged to contact the theme lead with questions about the delivery and use of the data. The following documents, diagrams, and reports describe the SSURGO standard as well as the tools and procedures that are necessary to effectively use this data. SSURGO Data Packaging and Use (PDF; 117 KB): This document describes the format of a SSURGO export file, and discusses some of the applications available for using this data. SSURGO Data Model Diagram – Part 1 (PDF; 31 KB): This diagram shows the soil tabular and spatial data tables in the SSURGO standard, and how those tables are related. Only primary and foreign key columns are included in this diagram. See the report titled “SSURGO Metadata – Table Columns” for a complete listing of all columns in each table. The information in this diagram is also available in non-graphical format in the report titled “SSURGO Metadata – Relationships”. SSURGO Data Model Diagram – Part 2 (PDF; 18 KB): This diagram shows the static metadata and Soil Data Viewer related tables in the SSURGO standard, and how those tables are related. Only primary and foreign key columns are included in this diagram. See the report titled “SSURGO Metadata – Table Columns” for a complete listing of all columns in each table. The information in this diagram is also available in non-graphical format in the report titled “SSURGO Metadata – Relationships”. SSURGO Metadata – Unique Constraints Report (PDF; 22 KB): This report includes all unique constraints in a SSURGO database, i.e. primary keys and alternate unique constraints. This report includes table attributes Table Physical Name and Table Label, the physical name of the corresponding unique constraint and the physical name of the columns participating in that unique constraint. SSURGO Metadata – Relationships Report (PDF; 22 KB): This report includes all relationships in a SSURGO database. For each table, the relationships for which that table is the parent table are listed first, followed by the relationships for which that table is the child table. This makes it easier to find all relationships in which a given table participates, but results in each relationship being listed twice. For each relationship, the physical names of the join columns are included for both tables. The NRCS WEB Soil Survey (WSS) online mapping application is maintained by the USDA Natural Resources Conservation Service (NRCS) as the single correct and authoritative source of soil survey information. Web Soil Survey is best used on a laptop or desktop. Use with a smartphone presents limitations. Soil Data Viewer is a tool built as an extension to ArcMap that allows a user to create soil-based thematic maps. The application can also be run independent of ArcMap, but output is then limited to a tabular report. The soil survey attribute database associated with the spatial soil map is a complicated database with more than 50 tables. Soil Data Viewer provides users access to soil interpretations and soil properties while shielding them from the complexity of the soil database. Each soil map unit, typically a set of polygons, may contain multiple soil components that have different use and management. Soil Data Viewer makes it easy to compute a single value for a map unit and display results, relieving the user from the burden of querying the database, processing the data and linking to the spatial map. Soil Data Viewer contains processing rules to enforce appropriate use of the data. This provides the user with a tool for quick geospatial analysis of soil data for use in resource assessment and management. ESRI Soil Survey Maps are an online ArcGIS Map Service. The user should be knowledgeable of soils data and their characteristics when using this application.